The High Sparrow chides Queen Margaery that she needs to provide King Tommen with an heir, and that she should try to convert her grandmother Olenna to the Faith, subtly remarking that Olenna’s safety cannot be guaranteed otherwise. 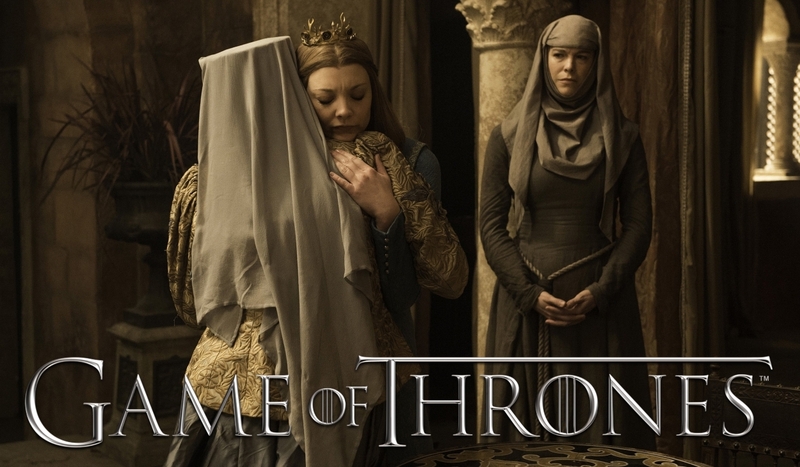 Margaery meets with Olenna, who attempts to convince her to leave King’s Landing and return to Highgarden. Margaery refuses, stating that as Queen, her place is supposed to be at King Tommen’s side. Seeing that she cannot change Margaery’s mind, Olenna reluctantly agrees. Margaery instead pleads for Olenna to return to Highgarden instead, slipping her a piece of paper with the sigil of House Tyrell drawn on it, indicating that she is still loyal to her family. Olenna: You will leave for Highgarden today. There is no law that says you must stay here. Margaery: I am the queen. It is my duty to serve my husband the king. But you should leave, Grandmother. Your place is at home. Olenna: I will never leave you. Never. Margaery: You must. Go home. Find comfort in prayer and good works. The Mother watches over us all. Olenna: I’ll see you soon, my dear. Margaery: Seven blessings to you, Grandmother.